Leclerc, aka the Comte de Buffon (1707-1788). Comte is a title of French noblity. The equivalent English term is ‘Count’ or ‘Earl’. The title could be purchased by one with money and high social standing. Buffon is a small town in eastern France. In the 1600s most naturalists believed the world was a few thousand years old and that species were created separately and organized into an unchanging hierarchy, with humans positioned just below the angels. In the 1800s, Darwin described a world that was inconceivably old, one in which life gradually changed from one form to another without any need for direct supernatural intervention. Roughly midway between those two views—both chronologically and intellectually—was the remarkable Georges-Louis Leclerc Buffon. François-Hubert Drouais (1727-1775), Portrait de Georges-Louis Leclerc, comte de Buffon, Localisation : Musée Buffon à Montbard. Buffon’s career centered on a single enormous project: an encyclopedia he called Histoire Naturelle, which he planned to contain everything known in his day about the natural world. Buffon managed to publish 36 out of his projected 50 volumes before he died. To create it, he was able to draw on his own astonishing expertise, which ranged from astronomy to botany, as well as the knowledge of experts he consulted. In writing his encyclopedia he did not merely parrot the opinions of others. Instead, he tried to explain all of the facts he amassed with overarching theories about the planet and its inhabitants. Buffon realized that to interpret the world, he had to understand its history. And despite censures from the Church, he did not rely on the Bible as a strict guide to that history. Instead, he used the new physics of Isaac Newton to conjecture how matter in motion might have formed the Earth. Buffon argued that life, just like Earth, had a history. Like many other Enlightenment thinkers, he thought that it could be generated spontaneously under the right conditions. In the hot oceans of the early Earth, Buffon claimed that vast amounts of life were generated from unorganized matter—even large animals sprang into existence. In time, as the world’s climate cooled, many animals migrated to the tropics. Their migration made sense of the discoveries in Buffon’s day of fossil elephants in Siberia and North America, while living elephants were only found in Africa and South Asia (see figure, right). The Siberian species gave rise to today’s elephants, while the North American forms simply became extinct. …Buffon’s theories were visionary yet doomed, because they were based on the relatively skimpy evidence that eighteenth-century naturalists had at their disposal. * his notions of biological change were not based on a coherent mechanism. Yet his theories foreshadowed some of the most important developments in the natural sciences in the decades that followed his death—from Cuvier’s discoveries about extinctions, to the evidence that Lyell and other geologists found for a vast age of the planet and life itself, to Darwin’s own theory of evolution. It may be true that no single idea of Buffon’s has withstood the test of time. But his work was still a milestone of science because he thought about the Earth and life in ways that few had before—both life and the Earth had a history. 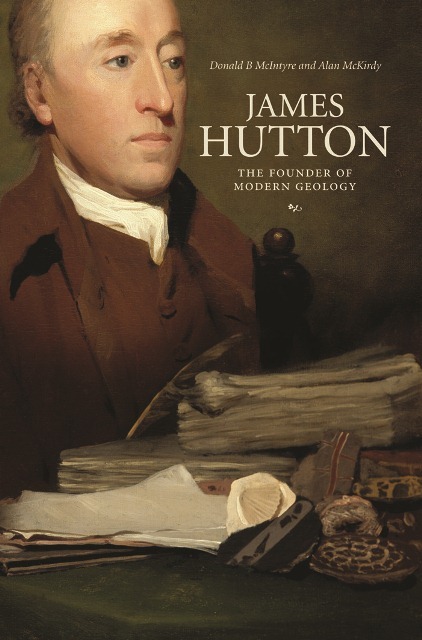 James Hutton 1726-1797. 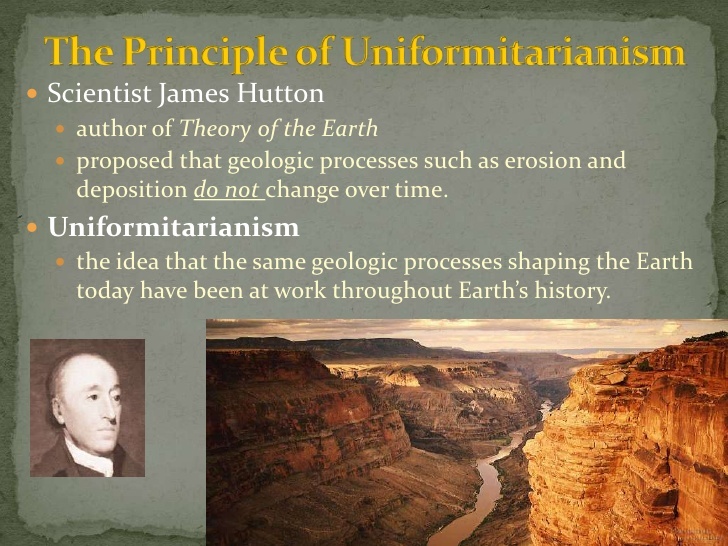 Scottish geologist, physician, naturalist – originated the theory of uniformitarianism. He explained the features of the Earth’s crust by means of natural processes over geologic time. 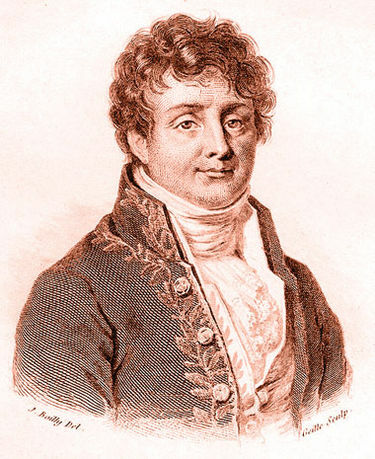 Joseph Fourier (1768-1830) French physicist and mathematician. He created mathematical tools that let us study how heat flows through solids. Fourier’s studies of heat led him to argue that Earth’s history had a direction: beginning warm, and then cooling through time. Indeed, some members of the society went further than mere ostracism–they stole Smith’s work. 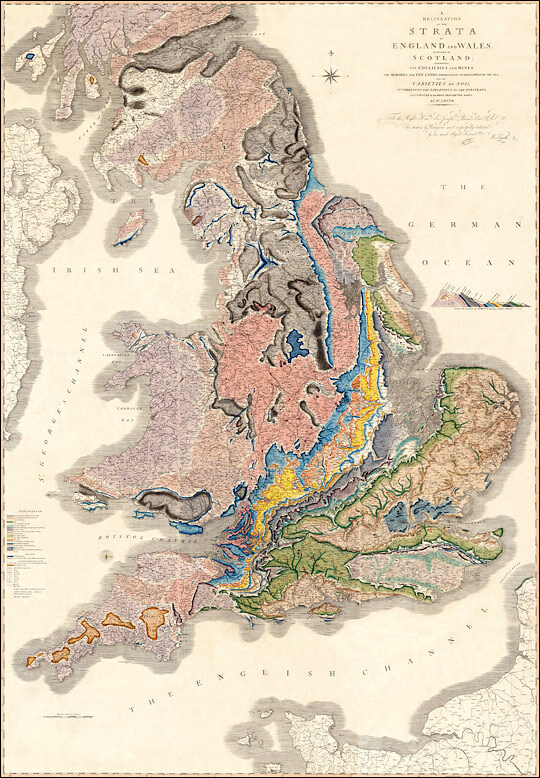 These cartographic plagiarists produced their own map, remarkably similar to Smith’s, in 1819. Meanwhile the chronically cash-strapped Smith had been forced to sell his prized fossil collection and was eventually consigned to debtor’s prison. -> Rain erodes mountains, while molten rock pushes up to create new ones. 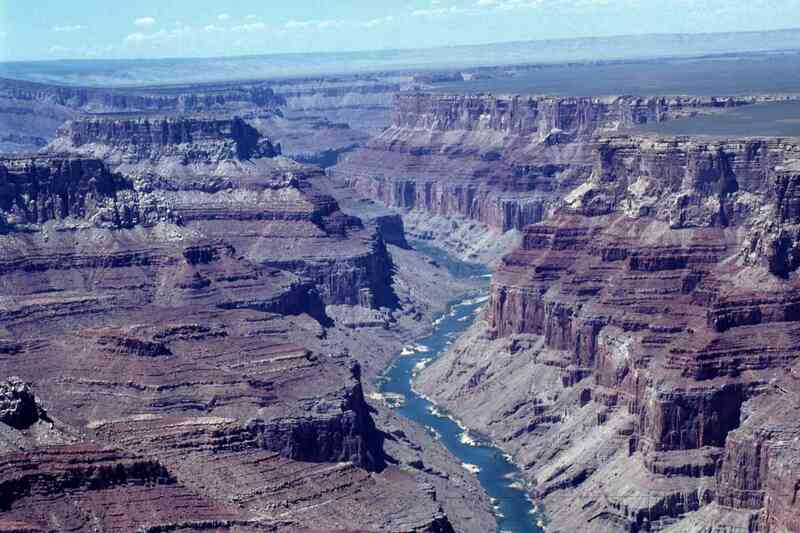 The eroded sediments form into layers of rock, which can later be lifted above sea level, tilted by the force of the uprising rock, and eroded away again. These changes are tiny, but with enough time they could produce vast changes. Hutton therefore argued that the Earth was vastly old — a sort of perpetual-motion machine passing through regular cycles of destruction and rebuilding that made the planet suitable for mankind. Charles Lyell (1797 – 1875) traveled through Europe to find more evidence that gradual changes, the same we can see happening today, had produced the features of the Earth’s surface. He found evidence for many rises and falls of sea level, and of giant volcanoes built on top of far older rocks. Processes such as earthquakes and eruptions, which had been witnessed by humans, were enough to produce mountain ranges. Valleys were not the work of giant floods but the slow grinding force of wind and water. 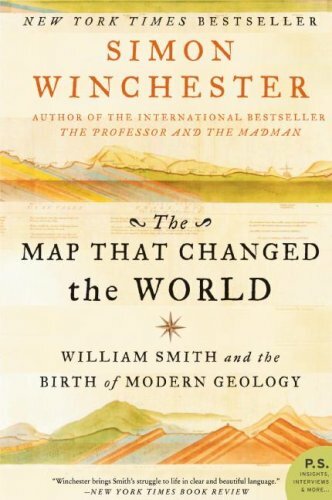 Charles Lyell’s version of geology came to be known as uniformitarianism, because of his fierce insistence that the processes that alter the Earth are uniform through time. 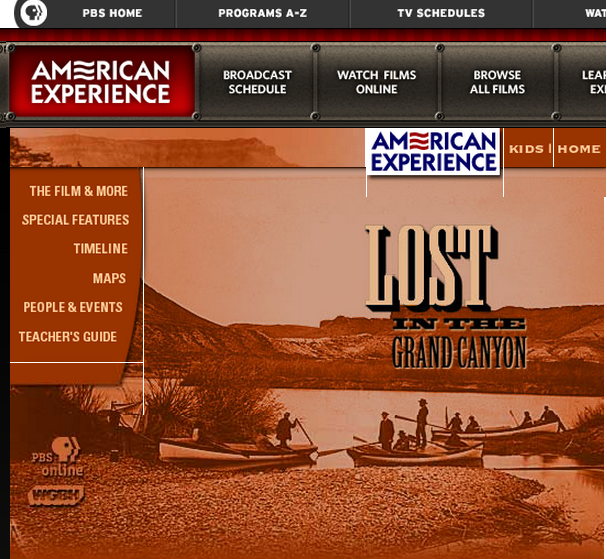 Lyell crafted a powerful lens for viewing the history of the Earth. On Darwin’s voyage aboard the Beagle, for example, Darwin was able to decipher the history of the Canary Islands (by applying Lyell’s ideas to the volcanic rock he encountered there. Today satellite measurements reveal that mountains may rise an inch a year, while radioactive clocks help show how they’ve been rising that way for millions of years. But Lyell could never have grasped the mechanism — plate tectonics — that makes this kind of geological change happen. Lyell had an equally profound effect on our understanding of life’s history. He influenced Darwin so deeply that Darwin envisioned evolution as a sort of biological uniformitarianism. Evolution took place from one generation to the next before our very eyes, he argued, but it worked too slowly for us to perceive. 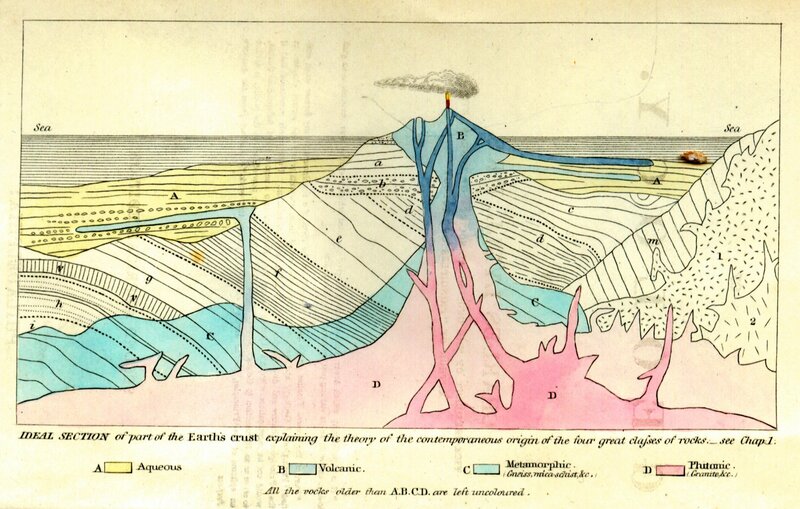 His most famous work: “Principles of Geology: Being an attempt to explain the former changes of the Earth’s surface, by reference to causes now in operation” Published in 3 volumes in 1830–1833. 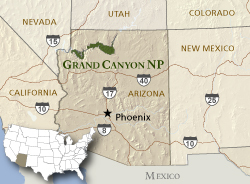 Powell leads a scientific expedition down the Colorado River and through the Grand Canyon – provides evidence of Earth’s very long existence. 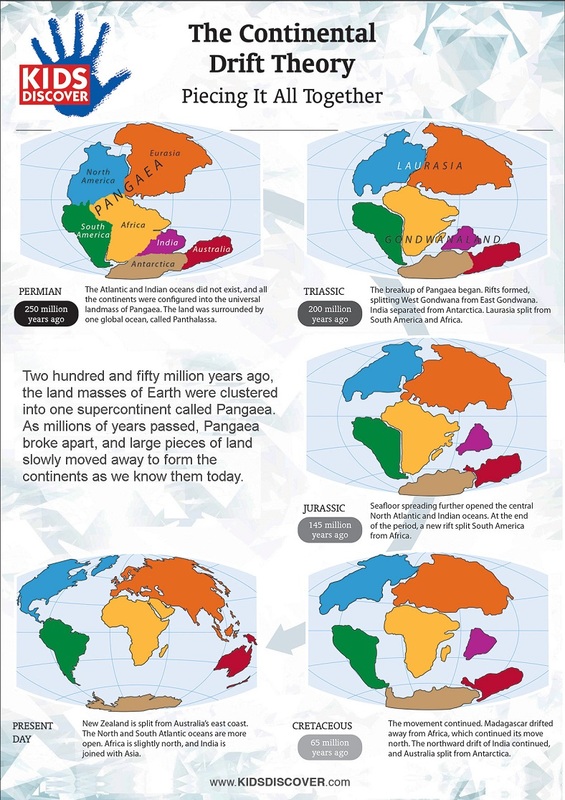 Perhaps the most important discovery in Earth Science was the discovery that continents move (continental drift). Alfred Wegener (1880 – 1930) a German geophysicist and meteorologist, first published his theory on this in a lecture in Germany, in 1912. 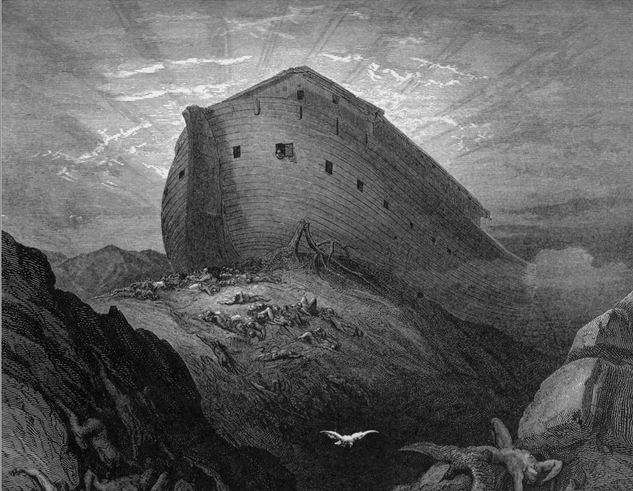 The world is said to have been created in only 7 days, the world is only 6,000 years old, the great flood of Noah killed off the dinosaurs, and this flood carved out all the valleys and canyons that we see today. 2. Scientific catatrophism – Early 19th century. 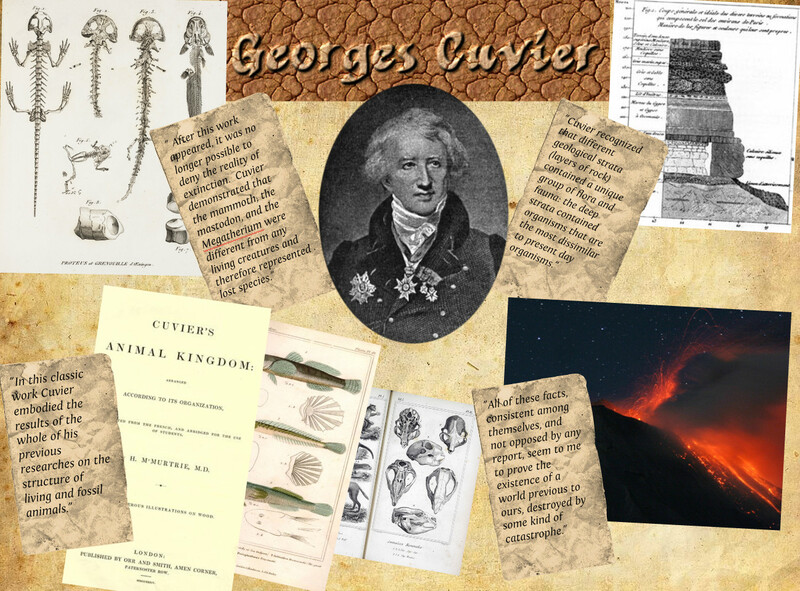 French scientist Georges Cuvier examined the fossil record. He speculated that low-lying areas near the sea were flooded in aquatic catastrophes, causing the massive extinctions seen in the fossil record. But did not literally accept the story of Noah’s flood. In the late 1700s. Abraham Gottlob Werner, proposed that all of the Earth’s rocks were formed by rapid chemical precipitation from a “world ocean,” which he then summarily disposed of in catastrophic fashion. This is part of an early scientific hypothesis called Neptunism. While this hypothesis was eventually disproven, note that this is how science advances: People study the world, and propose a testable explanation (hypothesis) for what we see. Subsequent research then informs us whether our hypothesis is correct or not. Werner’s observations and hypothesis making is certainly an important example of the scientific method in action. 3. 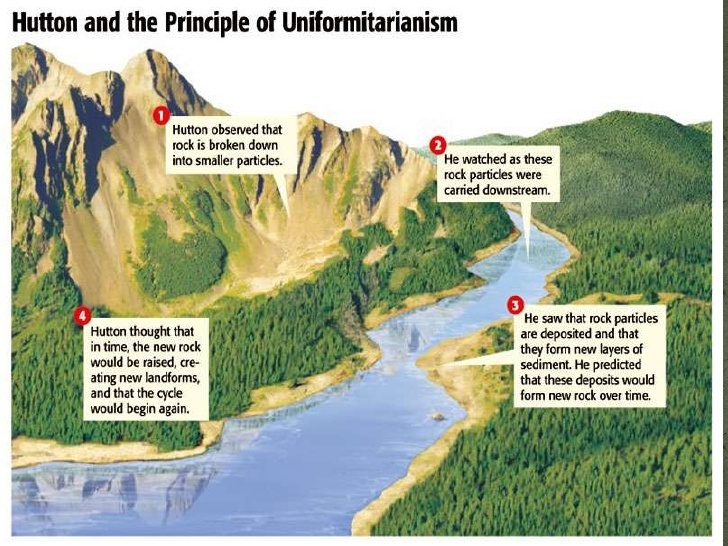 Gradualism – Promoted by Hutton and Lyell. Features of our world were not created by catastrophes. Rather, our world was gradually changed by natural processes, over very long periods of time. 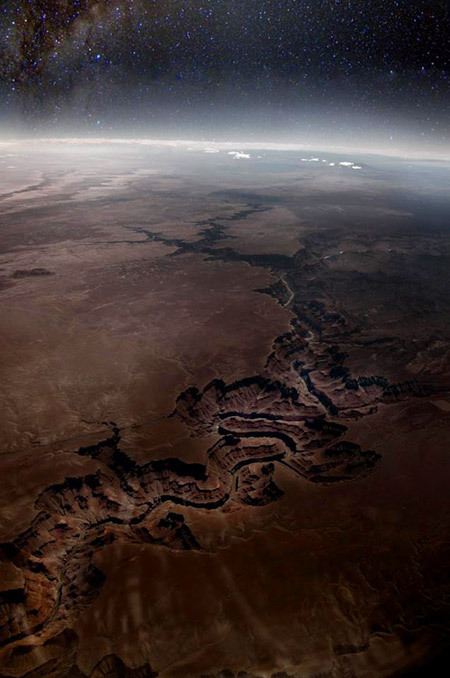 Canyons are slowly carved by rivers; new mountains built by continents slowly moving into each other; old mountains are slowly eroding due to weather, etc. 5. 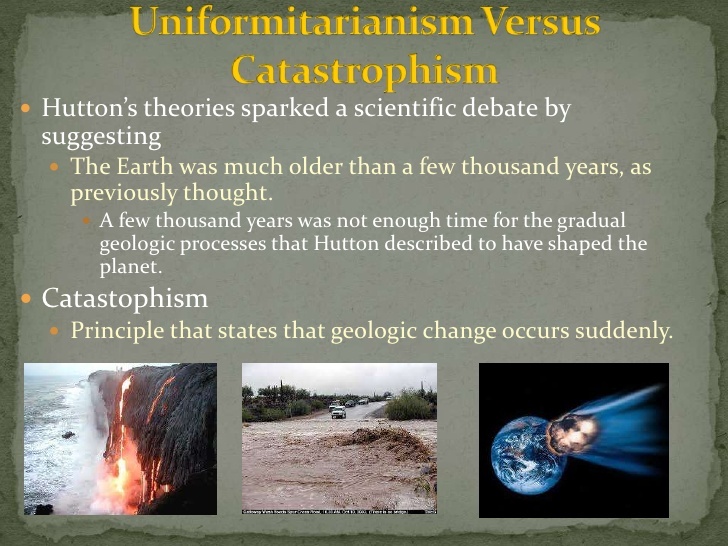 The modern synthesis: Gradualism, uniformitarianism and – very rarely – catastrophism all occur. * Rare, monsterously large eruptions of basalt that create lava flood over areas greater than 100,000 square kilometer. These are called Large igneous provinces. They are associated with mass extinction events. A Framework for K-12 Science Education: Practices, Crosscutting Concepts, and Core Ideas (2012), from the National Research Council of the National Academies. By the end of grade 12. Radioactive decay lifetimes and isotopic content in rocks provide a way of dating rock formations and thereby fixing the scale of geological time. ES.3 Earth’s History: Relative and Absolute dating. Students understand that various dating methods — relative and absolute — have been used to determine the age of Earth. Benchmarks: American Association for the Advancement of Science.